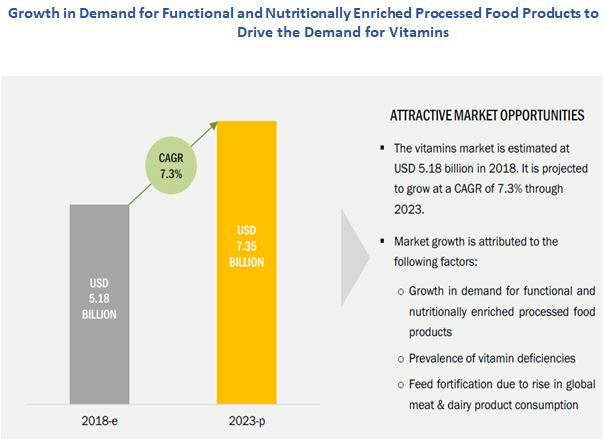 [144 Pages Report] The vitamins market was valued at USD 4.85 billion in 2017; it is projected to reach USD 7.35 billion by 2023, at a CAGR of 7.3% during the forecast period. The growth in the demand for functional and nutritionally enriched processed food products, the prevalence of vitamin deficiencies, and feed fortification due to rise in global meat & dairy product consumption are factors driving this market. Key regions were identified along with countries contributing to the maximum share. Secondary research was conducted to find the value of the vitamins market for regions such as Europe, North America, Asia Pacific, and RoW. The key players were identified through secondary sources such as the Food and Agriculture Organization (FAO), the US Department of Agriculture (USDA), the International Monetary Fund (IMF), the World Bank, and the Organisation for Economic Co-operation and Development (OECD); while their market shares in their respective regions were determined through both primary and secondary research processes. 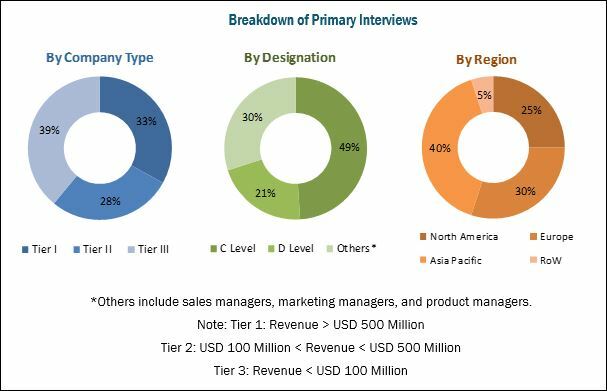 The research methodology included the study of annual and financial reports of top market players, as well as interviews with industry experts (such as CEOs, VPs, directors, and marketing executives) to obtain key insights (both quantitative and qualitative) for the vitamins market. The various contributors involved in the value chain of the vitamins market include raw material suppliers, R&D institutes, vitamins manufacturers [Koninklijke DSM N.V. (Netherlands), BASF (Germany), Lonza Group (Switzerland), Glanbia plc (Ireland), and ADM (US)], manufactures for end-use products (food & beverage, healthcare, feed, and personal care products) and government bodies & regulatory associations [the US Department of Agriculture (USDA), the Food and Drug Administration (FDA), and the European Food Safety Authority (EFSA)]. This research report categorizes the global vitamins market based on type, application, source, and region. With the given market data, MarketsandMarkets offers customizations according to a company’s specific scientific needs. 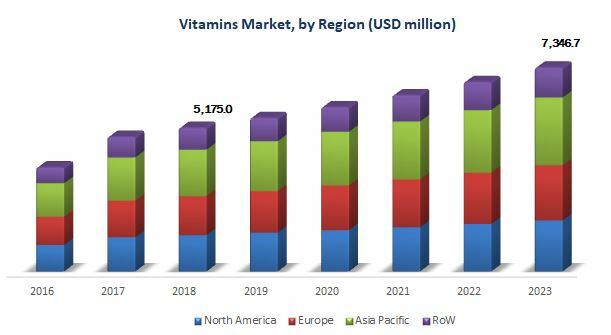 The vitamins market is estimated to be valued at USD 5.18 billion in 2018 and is projected to reach USD 7.35 billion by 2023, at a CAGR of 7.3% during the forecast period. The market is driven by growth in demand for functional and nutritionally enriched processed food products, the prevalence of vitamin deficiencies, and feed fortification due to rise in global meat & dairy product consumption. The vitamins market, based on type, has been segmented into vitamin B, vitamin E, vitamin D, vitamin C, vitamin A, and vitamin K. The market for vitamin B is estimated to dominate in 2018. The increased demand for the fortification of food and feed products with certain types of B vitamins such as B6 and B3 has encouraged major vitamin manufacturers such as the Lonza Group and DSM to expand their production capacities through the establishment of manufacturing plants in key demand markets such as China. Such factors, along with the easy availability of vitamin B for use in various applications, have accelerated the growth of this segment. The vitamin C segment is projected to grow at the highest CAGR from 2018 to 2023. Vitamin C is one of the major sources of antioxidants and helps to absorb iron; hence, vitamin C is highly required while consuming supplements containing iron. The increasing focus of consumers on health and wellbeing, along with multiple benefits provided by vitamin C such as faster healing of wounds and maintenance of skin, eye health, and immune system, offers a greater opportunity for growth to this market. The vitamins market, by application, has been segmented into healthcare products, food & beverages, feed, and personal care products. The healthcare segment is estimated to dominate the market in 2018. Vitamins have considerable scope in health care products such as dietary supplements and pharmaceutical products, mainly due to the growing focus of health-conscious consumers on preventive healthcare. The demand for vitamins is further witnessing an increase due to the high prevalence of vitamin deficiencies in both developed and developing countries. The food & beverages segment is projected to grow at the highest CAGR from 2018 to 2023. The rising popularity of fortified food & beverages and the continuous developments and new product launches are boosting the growth of the vitamins market in the food & beverage industry. The vitamins market, by source, has been segmented into synthetic and natural. It is estimated to be dominated by the synthetic segment in 2018, owing to the lower cost of production of synthetic vitamins as compared to natural vitamins. Asia Pacific is estimated to dominate the vitamins market in 2018 and is also projected to grow at the highest CAGR from 2018 to 2023. The market in this region is majorly driven by China, which is the largest producer, exporter, and consumer of vitamins. Further, the rise in incomes, increase in purchasing power, and significant consumer demand for nutritional & healthy products are also driving the consumption of vitamins in various industries in the region. Further, the market for vitamins in Asia Pacific is also experiencing growth due to its growing application in the feed industry. The region accounts for the largest livestock population and caters to significant demands for livestock-based products such as milk, egg, and meat. Quality feed is essential for livestock growth and performance. As the livestock owners are becoming increasingly conscious regarding the importance of adequate nutrition, essential micronutrients such as vitamins are experiencing significant growth in demand in Asia Pacific’s feed industry. The majority of vitamins available in the market is synthetic in nature. The major factor responsible for the popularity of synthetic vitamins is the low availability of raw materials for naturally sourced vitamins, which results in higher production costs associated with naturally sourced vitamins than synthetic vitamins. Most of the synthetic vitamins are produced from petroleum extracts or coal tar derivatives, which serve as cheaper raw materials. Even though naturally sourced vitamins have a higher preference among consumers due to their natural source and higher bioavailability compared to synthetic vitamins, production of naturally sourced vitamins is associated with higher production costs and requires a higher investment. Additionally, high extraction costs associated with natural vitamins further contribute to the high production costs of naturally sourced vitamins. Therefore, a constrained supply of raw materials for natural vitamins, coupled with high costs, restrains the market growth for vitamins. The global market for vitamins is dominated by players such as Koninklijke DSM N.V. (Netherlands), Glanbia plc (Ireland), ADM (US), BASF (Germany), Lonza Group (Switzerland), Vitablend Nederland B.V. (Netherlands), SternVitamin GmbH & Co. KG (Germany), Farbest-Tallman Foods Corporation (US), Watson Inc. (US), Zagro (Singapore), The Wright Group (US), Rabar Pty Ltd. (Australia), Adisseo (France), Showa Denko K.K. (Japan), and BTSA BIOTECNOLOGíAS APLICADAS S.L (Spain). How big is the vitamin E acetate (synthetic) market in the world? 90.000 MT feed/food/pharma?